A well written tweet, posted at the perfect time can take the internet by storm, being retweeted and talked about for days afterwards. Below is a look at some of the best tweets of all time alongside of analysis of exactly what makes them go. 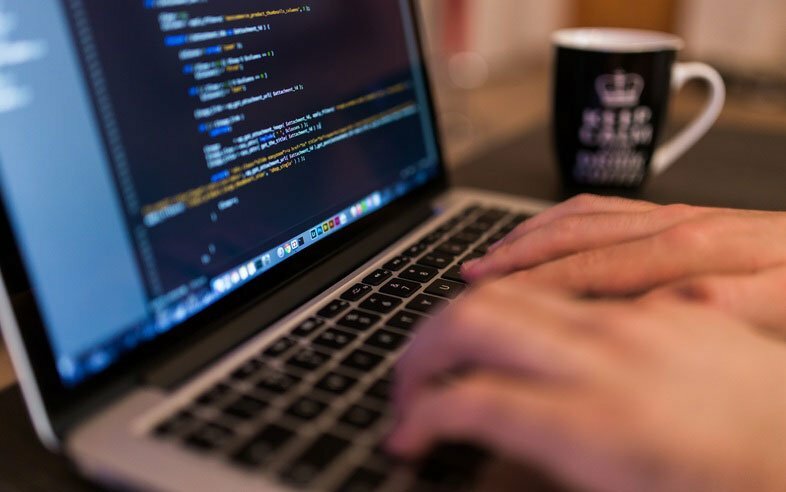 While many brands attempt to engage customers with promotions, exclusive news and other offers, some of the best remembered and most popular messages have little to do with the person or company themselves. They instead rely on humor, freak events and pop culture references to make a statement. While it might not seem that a funny message has much value, they are a great way to show off your personality of your brand and increase the number of people following you. A Twitter account which features a robotic rover sending tweets from another planet was a great idea. 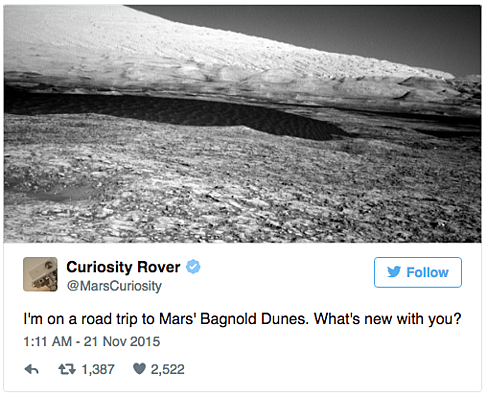 Rather than just tweeting dry and somewhat boring scientific data from the mission, NASA embraced social media and composed each message as if it was written by the Curiosity rover itself. The messages often contain pop culture references and selfies taken on Mars, which help to create and develop the rover’s personality. The account has become massively popular and currently has over 2 million followers. This is perhaps the most successful tweet which used another sporting event as a springboard. During the 2013 Super Bowl a technical problem caused power to be lost, which plunged the entire stadium into darkness for 35 minutes. During this completely unscripted event, someone at Oreo crafted a simple, funny and very effective image and posted it on Twitter. 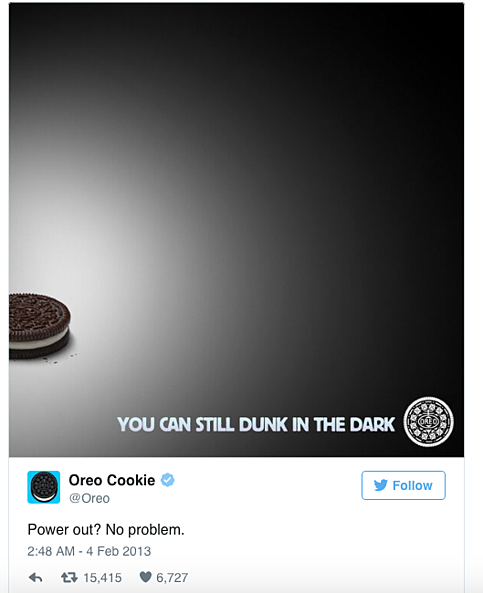 The message quickly went viral and Oreo avoiding having to pay millions of dollars for a Super Bowl half time ad. Kit Kat also demonstrated how a quick response can allow a brand to capitalize on an event. When the iPhone 6 was released, many users began to complain that the larger design of the smartphone caused it to bend when placed in pockets. 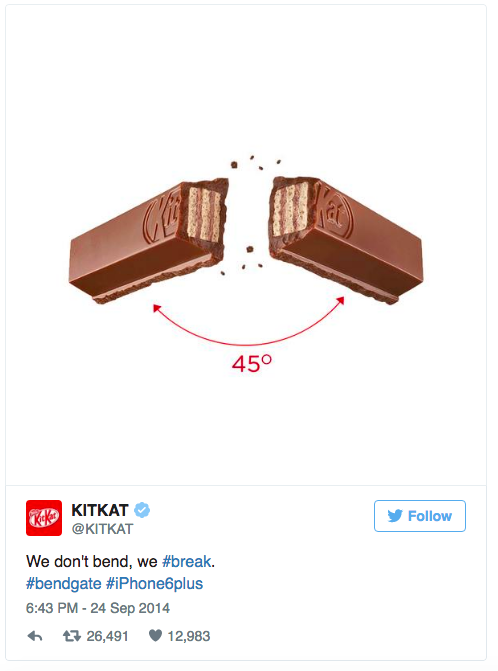 #Bendgate quickly began to trend on Twitter with Kit Kat joining the conversation with a simple and funny graphic which explained why bending and breaking is not always so bad. While Innocent Drinks are best known for producing smoothies, you would never know this from their Twitter feed. The majority of the post do not mention the brand or what it creates, but their fun and sometimes silly approach makes each of their post very sharable. 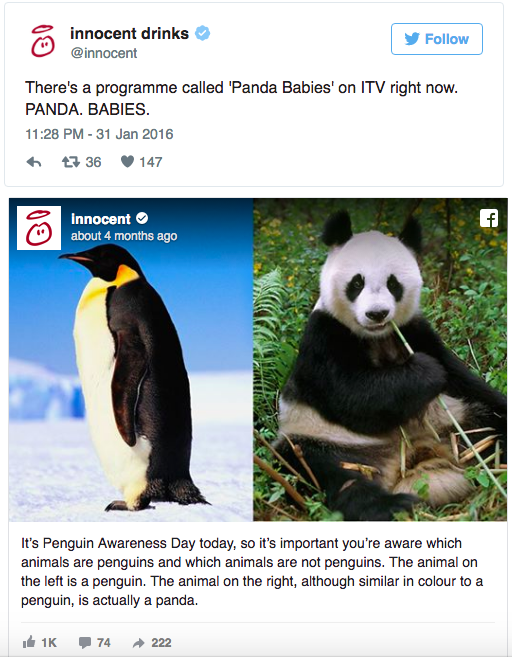 Innocent will often use popular sporting events or TV programs as the basis of their message, making users laugh while clicking to follow the Innocent Drinks account. In 2013, Apple unveiled the iPhone 5s, which was the first iPhone which was available in a full range of colors. 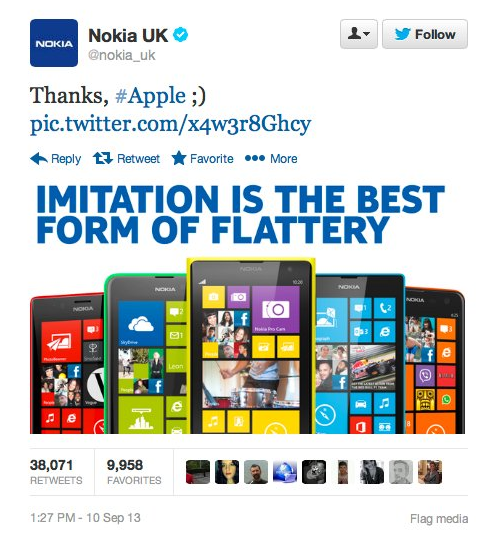 Rivals Nokia seized the chance to point out how similar the color palette used by Apple was to its own designs, declaring that ‘Imitation is the best form of flattery.’ By quickly responding in the brief window when there was still a buzz around the iPhone launch, Nokia managed to effectively use the launch of a rival product to boost their own profile. This funny message was retweeted over 38,000 times and was widely reported across the internet. Airlines often struggle with social media because they spend the majority of their time dealing with tweets from customer complaining about delayed flights and other travel issues. 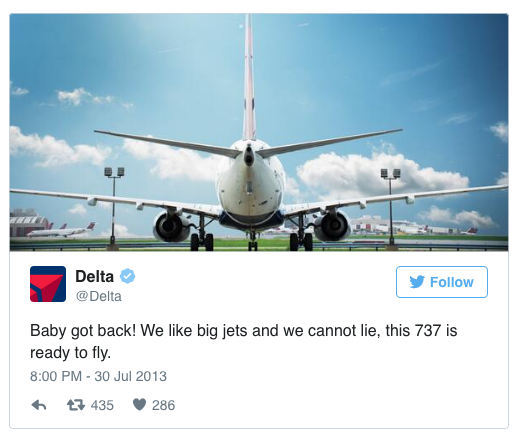 As well as responding to these complains and messages, Delta Airlines have also managed to keep their Twitter feed fun by posting funny parodies of pop songs and other cultural references. This way, when people check them out on Twitter, they don’t just see a screen full of message from unhappy customers. It turns out that even if you don’t know how to use Twitter, you can still become a sensation. When Ed Balls, a British Member of Parliament was trying to search Twitter for an article about himself, he inadvertently typed his own name into the message box and tweeted it to his followers. Ed Balls didn’t know how to delete the message and it was retweeted thousands of times. Every year on the day of the original tweet, the message is often retweeted again in celebration of “Ed Balls Day”, with Ed Balls himself retweeting the message. The MP even took part in a charity auction in which a signed printout of the message was sold. 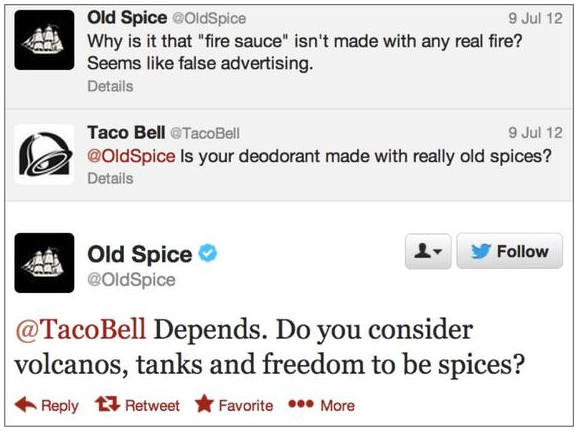 While these two companies, one dealing with aftershave for men and the other fast-food, might seem like unlikely competitors, they were both engaged in a brilliant exchange on Twitter. It began when Old Spice questioned the authenticity of the fire sauce served with Taco Bell meals. Although there is no real competition between the companies, their tweets helped to boost the profile of each brand. If this post has inspired you to join the conversation on Twitter, check out our guide Twitter etiquette.